"Thank you Asian Imports. I have known Keith for many years and he never disappoints. My battery died late Friday night and he met me at my car early Saturday morning (even though he was closed) and got me back on the road. They have taken car of mine and my husbands cars for years and we are always happy. It's great to have an auto repair shop where they are trustworthy, professional and get it right!! I would highly recommend that you check them out for your next car service." 5 star review by Cheryl H.
"Very professional, helpful, and reliable. I thought I needed a wheel alignment since my car was pulling to the left. And I went in asking for an oil change, tire rotation, and wheel alignment. They called me once my car was all done and I asked about the wheel alignment, they said that my car did not need one and that the tire rotation had taken care of the issue. So happy that they did not charge me $100 more for a service I did not need. I deeply appreciate that!" 5 star review by Erick L.
If you are looking for an honest and dependable auto repair shop in Summerlin or Southwest Las Vegas, consider Asian Imports and Asian Imports Plus. 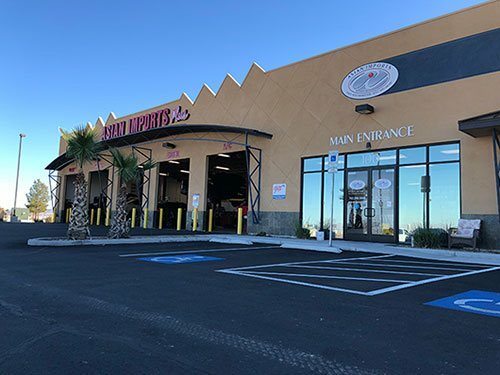 We are a family-owned and operated business that has been providing our friends and neighbors in Summerlin and Southwest Las Vegas with top-notch auto repair and maintenance services since 2001. We have ASE Certified Master Automobile Technicians on staff who specialize in Japanese and Korean vehicles. We also have the expertise and equipment to service all makes and models, foreign or domestic. Whether you need a small job, like an oil change, or a complete engine overhaul, our skilled and certified technicians can quickly inspect your vehicle, diagnose the problem, and apply the necessary solutions, saving you valuable time and money. Asian Imports is an AAA Approved Auto Repair Facility that has two great and easily accessible locations in Las Vegas. We are also a BBB Member with an A+ rating and a RepairPal Certified Facility. We perform all minor and major services and repairs, including factory-scheduled maintenance, using only original equipment and quality parts. Our work is covered by a 2 year/24,000 mile, no-hassle warranty. We also work with extended warranty companies. Asian Imports provides customers with same-day service on most automotive jobs. Last but not least, we offer fast, 0% financing (OAC) through Synchrony Financial. Feel free to spend some quality time in our clean and comfortable waiting room while our technicians are working on your vehicle. We offer various amenities including coffee, tea, soft drinks, water, free Wi-Fi, and HD television. We also offer complimentary shuttle service and local towing with major repairs, free preliminary inspections on all items, free written estimates, and free second opinions. We welcome you to visit our two convenient locations in Las Vegas and see what sets us apart from other auto shops in the area. Make us your last call!